Frank Miller was always a gritty writer. If you’ve kept your eyes and ears open in the past 15 years, you’d recognize such gems as 300 or Sin City which are both Miller classics. 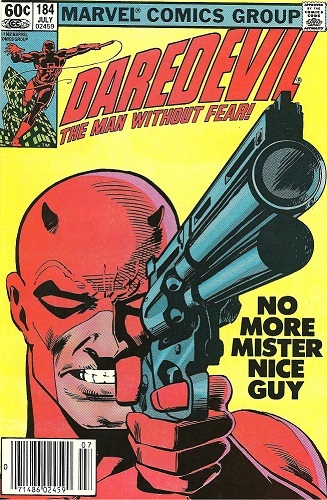 But most people who have no idea about Miller’s background don’t know that he actually began as a cover artist for Marvel and was then given the job as penciller for the Daredevil series. This would lead to his becoming both the writer of Daredevil for almost a decade before branching out on his own to work on DC titles such as The Dark Knight Returns and Year One. During his time on the Daredevil series however, he created Elektra and made Kingpin the main bad guy, which is still evident even today. Past the normal diversion from the original material to the violent and degenerate filled layers of Hell’s Kitchen was the inclusion of a martial arts element to Daredevil’s fighting style. Beyond that we got a different backstory to how Murdock was trained and how he became Daredevil. His father, who was once his greatest champion and reason for becoming a lawyer got turned into a physically abusive alcoholic. Even Murdock’s lovers and confidants were made into alternate versions that would be best suited in a noir piece. Within the martial arts backstory was a character named Stick who was the leader of the Chaste clan which trained Murdock for his eventual night outings as Daredevil. The rival clan was called the Hand. The popularity of Daredevil was at its peak when Miller was at the helm and two guys from New Hampshire named Eastman & Laird decided to parody it with a little comic called Teenage Mutant Ninja Turtles. The concept began innocently enough, with the Turtles and their sensei Splinter (homage to Stick) transforming from a chemical accident. The same chemical accident that Murdock was involved in when he got his super echolocation powers in Daredevil. Even the clan that the Turtles are fighting against is called the Foot, a clear homage to the Hand. Of course the Teenage Mutant Ninja Turtles went on to a great many successes in all mediums, where Daredevil has struggled to crossover. Hopefully in the next month when the Netflix series debuts, it’ll catch a break. With the constant success that much of the MCU has achieved in the last decade, it’ll be hard for it not to.